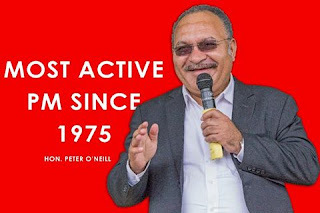 Prime Minister Peter O’Neill says he is looking for a higher level of intelligent public debate in the tenth Parliament as important legislation is presented. “The Tenth Parliament is a fresh start, an opportunity to deliver legislation that will further advance our Nation,” he said. “We will deliver a very safe and cost-effective APEC that will enhance attitudes towards Papua New Guinea and our economy. “Our people will gain greater access to technical information and capacity building in key sectors such as agriculture, fisheries, tourism and women in the economy. “With more than 15,000 delegates visiting Papua New Guinea over the coming year, they will spend more than K100 million on travel and hospitality in our country. “The ball is in the Opposition’s court,” stated the PM.